Native Americans (also called Aboriginal Americans, American Indians, Amerindians, or Indigenous Peoples of America) are the people, and their descendants, who were living in North, Central and South America and also in the Caribbean Islands when Europeans arrived. 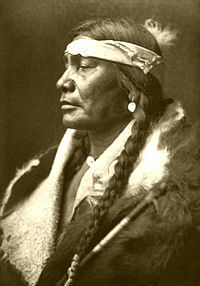 There are many different tribes of Native American people. They speak several different languages. There are more than three million Native Americans in Canada and the U.S. combined. Approximately 51 million Native Americans live in Latin America (Central and South America). Sometimes these people are called "Indians". But this is confusing because it is the same word used for people from India. When Christopher Columbus was sailing west, he did not know about the Americas (North, Central and South America). He thought he was going directly to India, so he called the people he met "Indians". Many Native Americans died after the Europeans came to the Americas. They died from diseases that came with the Europeans that were new to the Native Americans. Many died in battles with the Europeans, or because the Europeans made them work as slaves. Most of the these native people were hurt or killed by settlers who took their lands. The ancestors of Native Americans came to the Americas from Asia. Some of them may have come to America over 12,000 years ago when Alaska was still connected to Siberia (in Russia) by the Bering land bridge. This page was last edited on 4 July 2016, at 21:14.